Located in Vinh Phuc province, 45km north of Hanoi, Huong Canh retains its 300-year-old ceramic and pottery craft despite the influx of modernity. Ceramic products made by Huong Canh artisans are famous for their beauty, durability, color, and simplicity. For centuries, the Vietnamese people have had a folk saying: “Mong Cai porcelain, Huong Canh jars” to compliment two of the best-quality terracotta brands in the northern region. According to the village’s history, the Le-Trinh dynasty in the middle of the 18th century assigned Trinh Xuan Bien, a talented mandarin, to help the Huong Canh villagers improve their farming. He also taught the locals to make pottery products. When he died, he was honored as the craft’s progenitor. The feature that most distinguishes Huong Canh pottery is that tea stored in a Huong Canh ceramic jar will never grow moldy and will keep its fragrance. Wine, too, will not lose its fragrance or alcohol concentration when stored in a Huong Canh terracotta jar. Seeds stored in the jars are guaranteed to sprout on schedule. The local clay soil produces pottery that is waterproof and lightproof enough to keep food fresh for years. 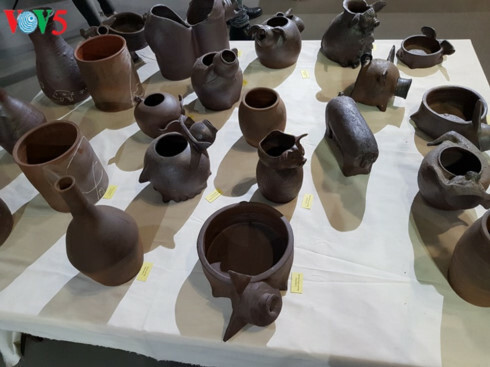 Nguyen Hong Quang, the owner of a pottery-kiln in Lo Cang hamlet, said: “Huong Canh pottery does not use a glaze because it is made from sediment clay with molecules that tightly join together to form a strong, waterproof barrier. Each product has a color which reveals the location of the kiln. The village is famous for hand-made pans, pots, teapots, jars, cups, and, small coffins. Lately Huong Canh has added new products to its traditional items. “Now we make pottery products both for daily use and as art. This has expanded our market. The price of ordinary pottery is low. A ton of clay made into ordinary pottery items earns 430 USD but the same amount of clay made into pottery art earns 1,290 USD. I have a shop in Hanoi and plan to open a showroom in HCMC soon,” said Quang. Huong Canh potters now make fine art pieces, statues, and reliefs in Vietnamese motifs. Village visitors can observe and participate in pottery production. Huong Canh pottery products are now sold nationwide and exported to other countries.